How about a tiny bit of wedding talk before I share today's delicious recipe? (*hint... scroll down if uninterested). Somehow, someway, we're now only 4 months away from our wedding date. HOW has it been nearly a year since we got engaged?! Time has flown! And now, suddenly... it's crunch time. We've already gotten all of the big stuff done, but there are definitely a lot of little things that still need to happen. I'm hand-addressing all of the envelopes, for example, which is waaayyy more time-consuming than one may think. I wouldn't say I'm DIYing a TON of stuff, but there's certainly a lot to do in my oh-so-elusive free time. Plus, once classes pick up next week, I'll be back to going to class after work -- with three 13 hour days where I'm not home until 9pm -- so I guess you could say I'm starting to stress a litttttllllle about how (when) everything is going to get done. Fortunately I have lots of kind friends and family that have offered to help, so I'll certainly be taking them up on their offers. I'm also finding it helpful to rely on my #1 piece of wedding advice that I've carried with me throughout this process: there are no rules except for the rules you care about. It's easy to get sucked into the wedding whirlwind and the pinterest pictures and the opinions of nearly everyone around you and the pressure to do things the way they're "supposed" to be done... but at the end of the day, the wedding is yours. Yours and your partner's. Are there wedding traditions you value? Then by all means, share in those traditions. But if there are traditions that you just don't care about, don't identify with, or don't understand the meaning of, then SKIP THEM. It should be simple. And we're trying to keep it that way. Sure, parents have a say (especially if they're helping to foot the bill), but it's your day. It's strange, but I have to constantly remind myself of this fact as I plan. Probably because things are often presented to you as rules, when really.... no. The lady at the invitation store, for example, told me that I have to have an "inner" envelope within the "outer" envelope, and I have to call my mom (and my female married guests) Mrs Husbandfirstname Lastname because that's traditional, and I have to have embossed font if I want to convey formality and blahblahblahblah. While these things were presented as rules, guess what? They're not. Many others probably choose and like these things, and that's just fine. But this is our wedding! And we don't want to follow those rules! My mom has her very own first name, thankyouverymuch. I don't see any reason to spend hundreds more dollars to have embossed font. And I really don't see any reason to have 2 envelopes and multiple pockets and cards. We'd rather keep it simple and eco-friendly. And us. My point? Do you. That's my take-it-or-leave-it advice for anyone else planning a wedding. Make the day true to you and your partner. Follow your values and preferences, not someone else's. At the end of the day, if it's a FUN and meaningful celebration that you and your guests enjoy and that you feel represents you as a couple, you've done it right. Okay, enough of the wedding talk? How about some brisket? That will SURELY make up for all of that chatter, huh? BRISKET. It's mouthwatering, fall-apart, flavorful meat. I loooove it. While brisket is actually a tougher meat due to all of its connective tissues, we can fix that. All we have to do is marinate it for a lonnnnggg time, then cook it for a lonnnggggg time in the oven at low heat. It turns into tender magic. 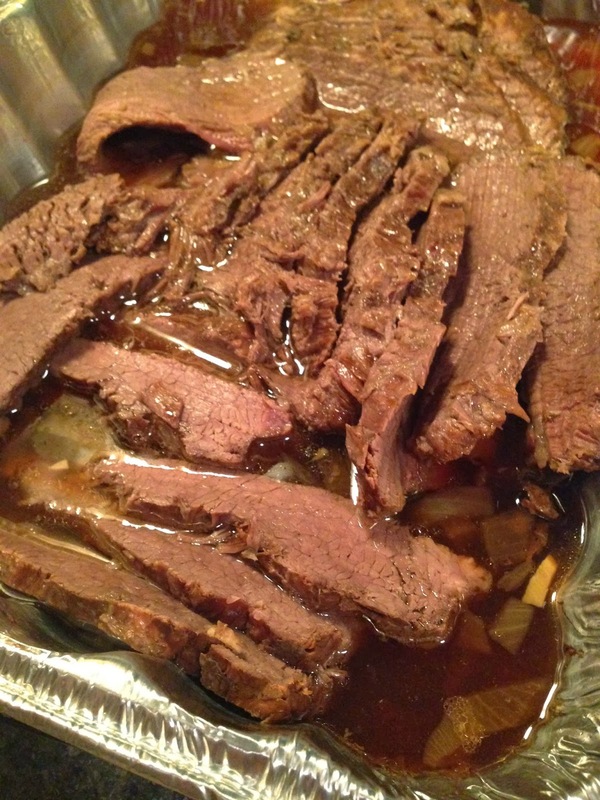 Truthfully, my favorite way to eat brisket is smoked from a BBQ joint, with the burnt edges and smoky flavor (in fact, that's what we're likely having to eat at our rehearsal dinner! I told you we're staying true to us). However, I unfortunately do not have a smoker in my backyard, and this is the next best option. Don't worry, it's still awesome. I tried out Pioneer Woman's brisket recipe after seeing her cook it on her Food Network show this weekend because it just looked sooo irresistible. Ryan and I went directly to the store after watching it and bought a 5 pound brisket. Marinated it for 24 hours then had it for a delicious Sunday night dinner. Of course, I made some tweaks to her recipe, but all in all, it's a winner. Whether you eat it plain or leftover on a sandwich with melted provolone like I did yesterday, I think you'll be happy. 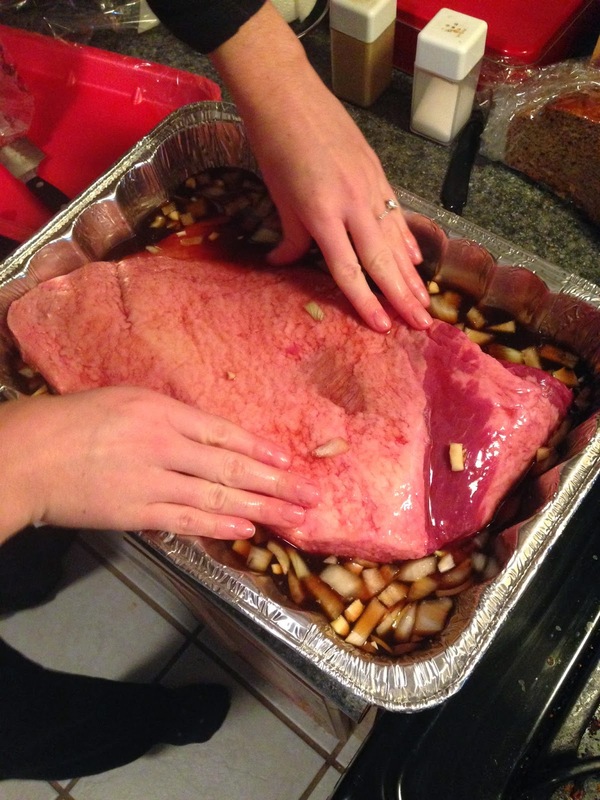 First, you'll need a big 'ol beef brisket. Ours was 5 pounds, though you may find an even bigger one. 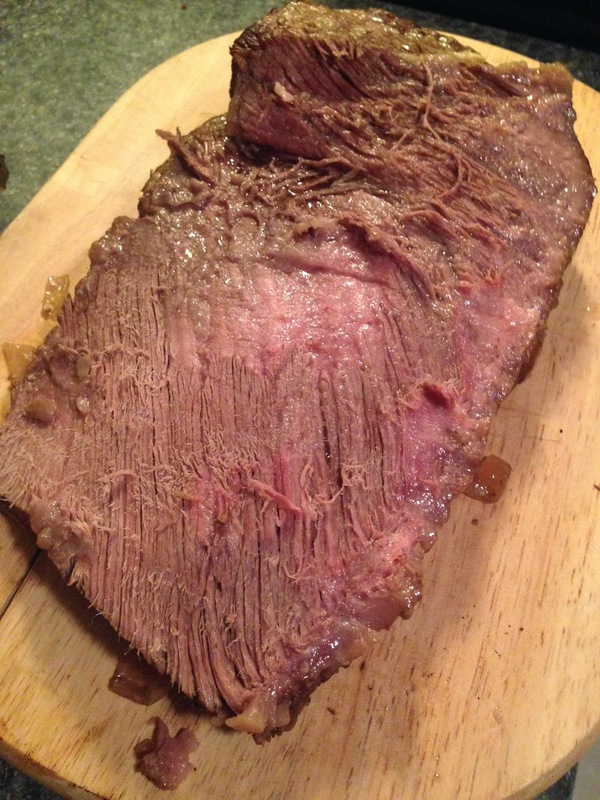 Oh, and be careful not to accidentally buy CORNED BEEF BRISKET unless you want a salty mess. Your brisket should have a fat cap on it, which we'll eventually get rid of, but it keeps the meat soo moist and flavorful while we cook it. 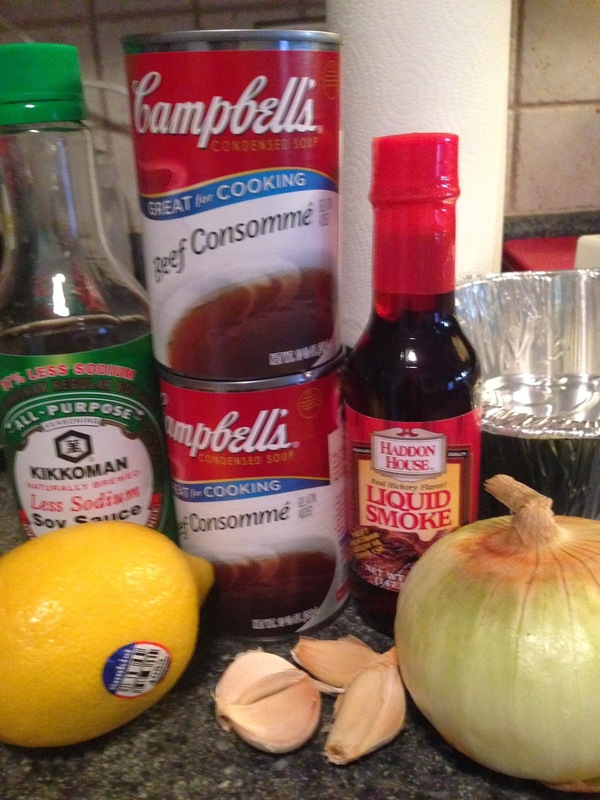 Also gather your marinade ingredients: low sodium soy sauce, beef conomme, liquid smoke, garlic, onion, and lemon. That's it. 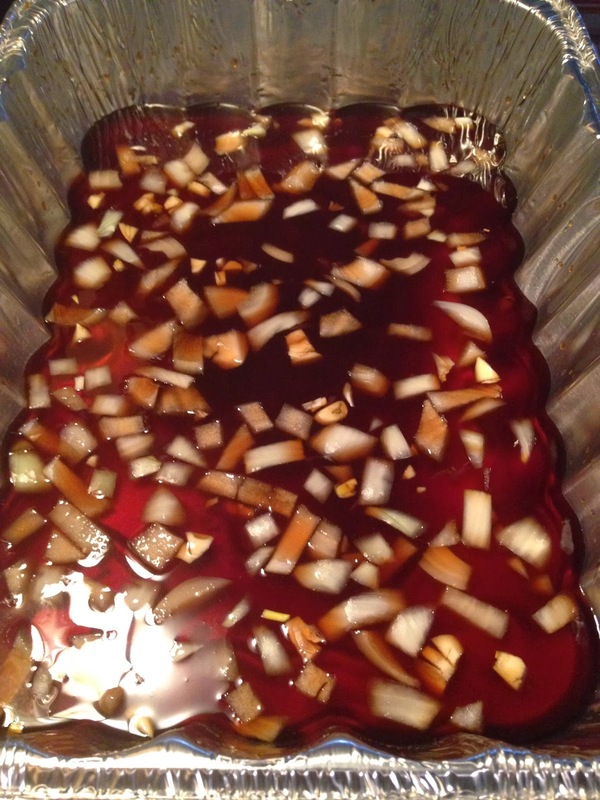 In a roasting pan, mix 1/4 cup soy sauce, 2 cans beef consomme, the juice of 1 lemon, 1 tbsp liquid smoke, half of a chopped onion, and 4-5 cloves of chopped garlic. 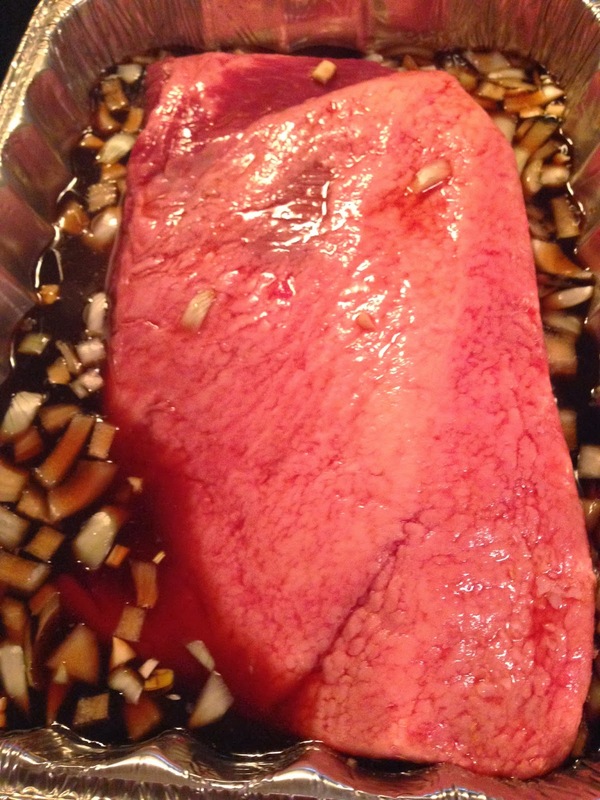 Take your brisket and dip the fat side into the marinade. Then place it in the marinade fat side up. 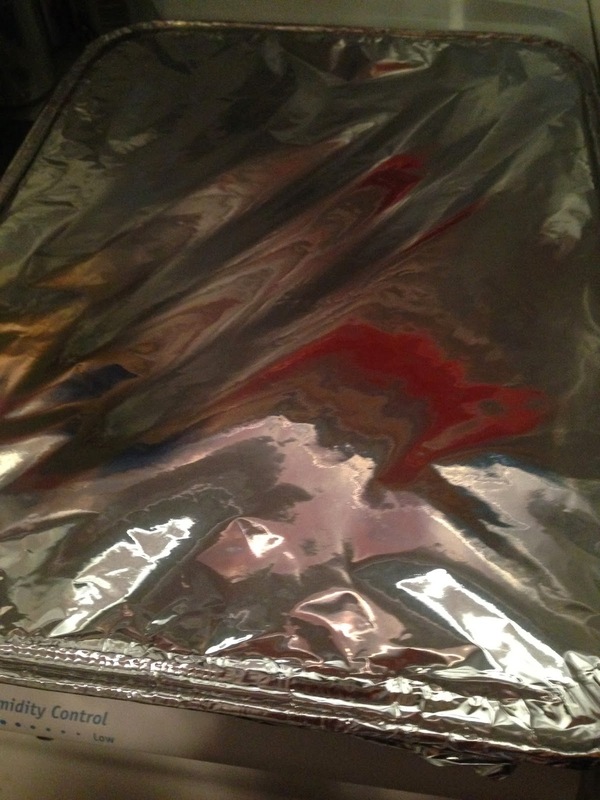 Cover with foil and refrigerate for about 24 hours. When ready to cook, you don't have to do much of anything. Turn the oven to 300 degrees, put the roasting pan in with the foil still on, and walk away for several hours. You'll want to cook it for about an hour per pound. So about 5 hours for a 5lb brisket. After that time, remove the foil. Now we want to cut that fat cap off. Using a very sharp knife. Gently cut the fat off the top of the brisket, trying not to lose too much meat. You'll be left with a big hunk of glorious meat. 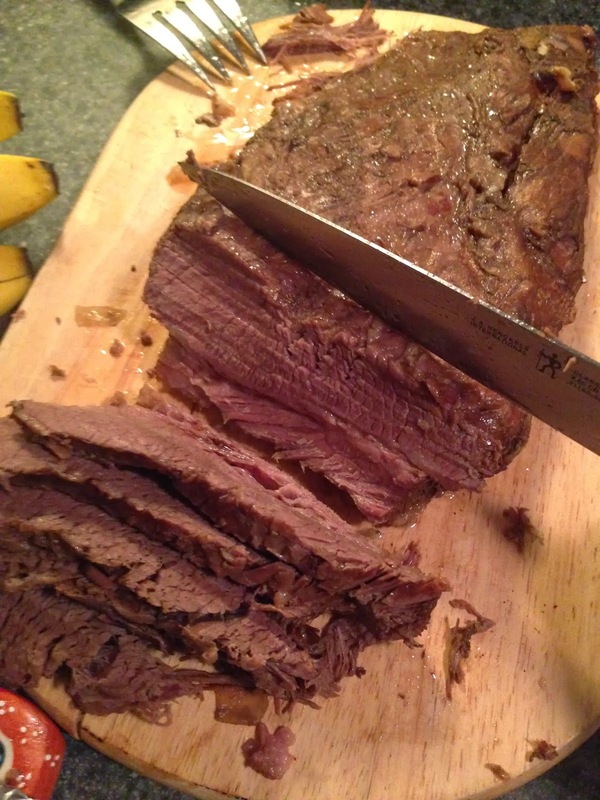 Flip it over then, using that very sharp carving knife, cut the brisket into slices AGAINST THE GRAIN. Pour out about half of the liquid out of the roasting pan, leaving a pretty shallow layer. Skim any visible fat off the top of the liquid. Add the sliced brisket back to the pan. Cover it with foil again then place it BACK into the oven for about half an hour, letting the slices soak up all that juice. Take it out and enjoy! 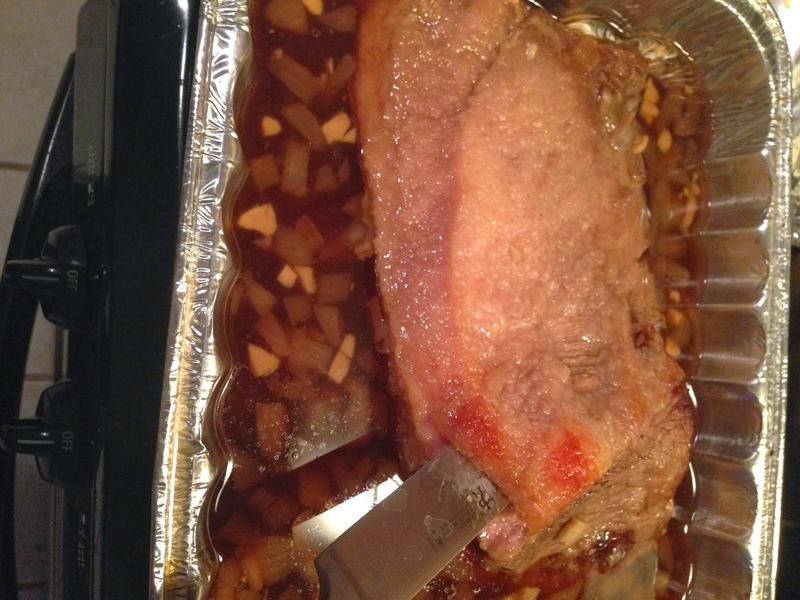 -In a roasting pan (disposable is fine), mix all ingredients besides the brisket. 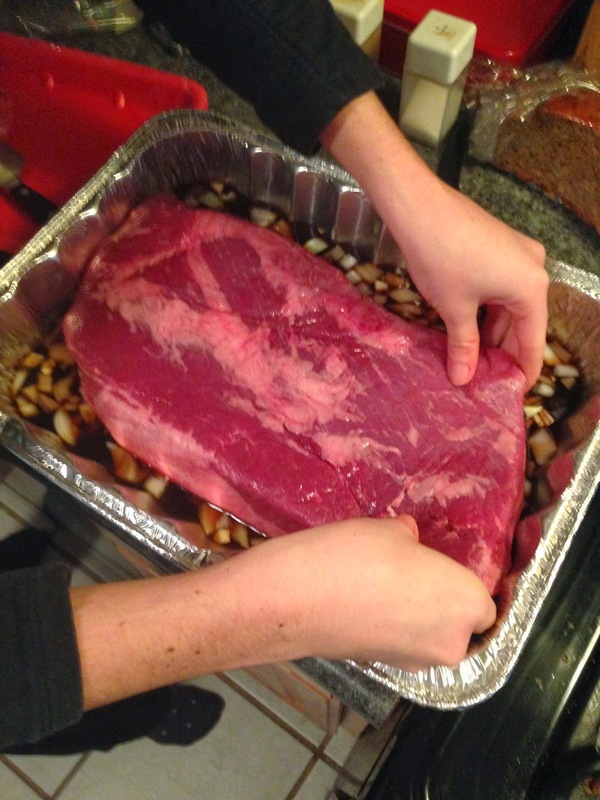 -Take your brisket and place into the pan. First, dip the fat side into the marinade. Then, flip over (fat side up) and let sit in the marinade. Cover with foil and refrigerate for about 24 hours. -When ready to cook, preheat oven to 300 degrees. -Place pan in oven, foil still on. Cook for about 1 hour per pound (so, about 5 hours for a 5 lb brisket). -Remove from oven. Remove foil. 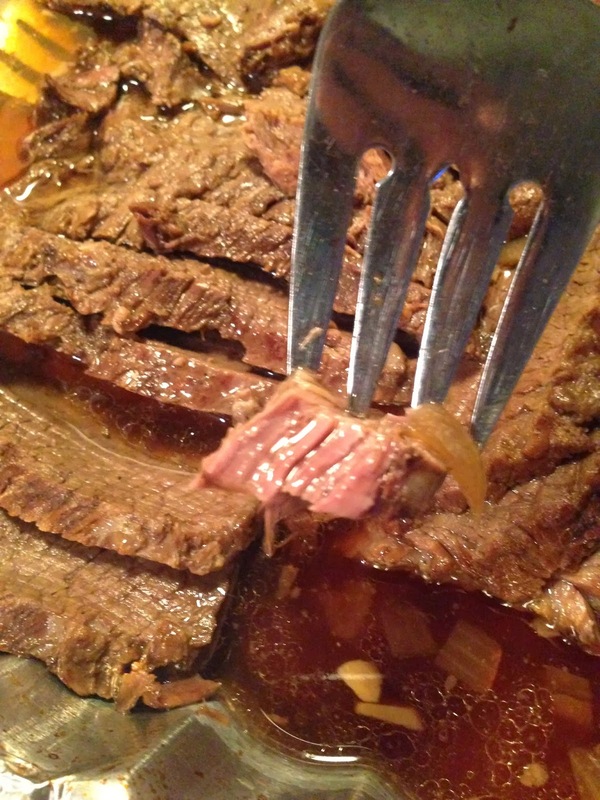 Cut the fat cap off the top of the brisket and discard. Transfer brisket to a carving board. Slice against the grain into slices. 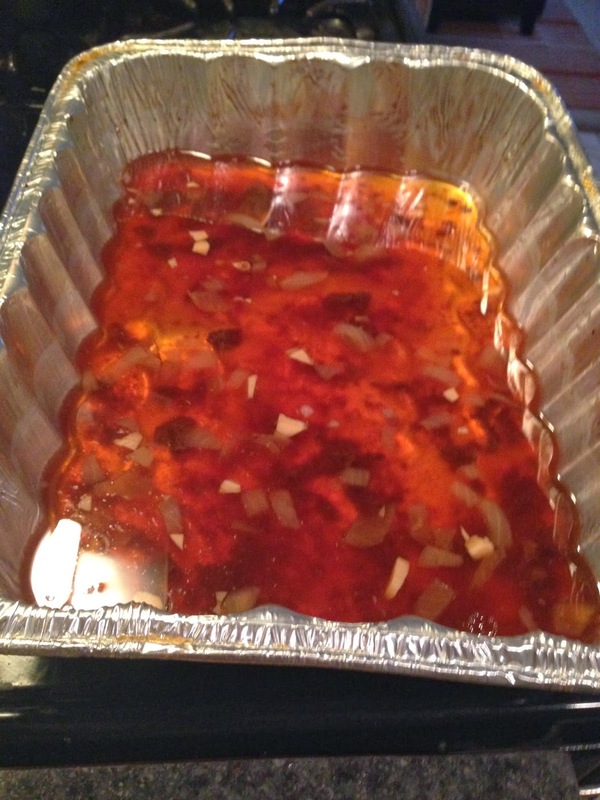 -Pour about half of the marinade out, leaving a shallow layer. Skim any visible fat off the top of the liquid. 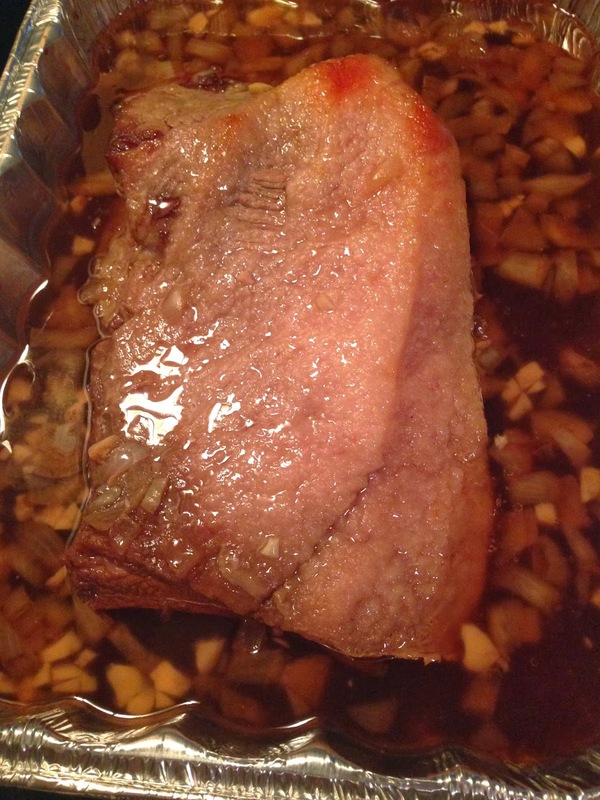 Return the brisket slices to the pan with the liquid, turning to coat. Cover with foil again, then place back in the oven for about 30 minutes. I love your wedding advice! I am getting married in Oct and have had to put my foot down on a couple of things that my mom kept pushing. I hope you enjoy your final months of planning! Can’t wait to try the brisket too :) I made the banana bread Sunday and it the perfect snack! Thanks for all of the great ideas! parents can definitely make things a *little* trickier ;) happy wedding planning to you as well! and I'm so glad you enjoyed the banana bread. Enjoy the rest of the wedding planning - It surely goes by too fast!